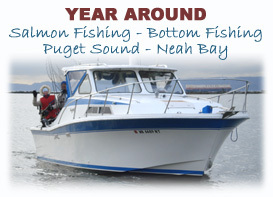 Excel Fishing Charters offers Washington’s finest saltwater fishing action. Depending on the season, enjoy Salmon, Halibut, Ling Cod, and Bottom Fish fishing trips aboard our safe, fully equipped 28 foot boat, the “Cabazon”. Excel Fishing Charters departs from both Neah Bay, Washingtion where we fish Halibut, Ling Cod, Bottom Fish, and Salmon and Sekiu Washington where we offer Halibut and Salmon charters. Also enjoy our popular Marine tours including Whale watching from beautiful Neah Bay. We offer a personalized fishing experience year around for a single person or for groups of up to 6 passengers using only quality gear and equipment. Come let our experience work for you. Whether a fishing novice or a seasoned pro, enjoy a personalized fishing trip with Captain Tom Burlingame from Neah Bay, or Sekiu Washington. Come let our experience work for you. Whether a fishing novice or a seasoned pro, enjoy a personalized fishing trip with Captain Tom Burlingame from Neah Bay, or Sekiu Washington. Neah Bay and Sekiu are located on the most Northwest tip of Washington's beautiful Olympic Peninsula. Both ports are known for their great fishing and natural beauty. Neah Bay located on the Makah Indian Reservation, is as close to Alaska in fishing experience and scenery as you will find in the lower 48 states. Most of our fishing trips from Neah Bay are done in the Pacific Ocean, with the exception of offseason Bottom Fish, which is done on the Strait of Juan de Fuca. Sekiu trips offer nearly the angling experience as our Neah Bay trips, but are done solely within the Strait of Juan de Fuca where calm water is the norm and you can always see the shore.